Not a summer goes by, not one, that I don’t think back to my childhood summers in the sweltering hot cotton land of the Mississippi Delta and the contrapuntal oak-lined Fifth Avenue that ran south from Highway 8 past the college and ended when it T’ed into Yale Street. Yale marked the end of town. There was a cotton field on the other side of it. Fifth Avenue had sidewalks that were in solid shade from Yale ten blocks north to the college at Court Street. That was my world in 1960 when I was old enough to ride my bike a bit farther than just in circles in front of my house on Deering, which intersected Fifth halfway between Yale and the college. Fifth had been there a long time — more than forty years, because that’s when Delta State College was founded. The town was ninety years old by then. Houses on Fifth Avenue were established with their own tall trees and lushly landscaped front yards. The oaks on Fifth Avenue were big and old and twisted up out of the ground to form a canopy over the street. Tree roots pushed the concrete sidewalk up and cracked it and separated it in places. That made it even better for riding bikes on. A girl needs a bump to ride over. I got my bike for Christmas when I was seven. It was an aqua color with cream trim and a tan seat, from Santa Claus and Sears. I rode it until I married fourteen years later. Summers would have been pretty miserable without that shady sidewalk. Up to the north six blocks was the Gold Star market across from the college. Mostly, though, I rode south to Yale Street, where a Standard Oil service station was my destination. I’d buy a six-ounce, ice cold Coca Cola, some bubble gum, and five red hot jawbreakers — the ones that were red and hot and melted down to white and then at the center was a black cool taste. 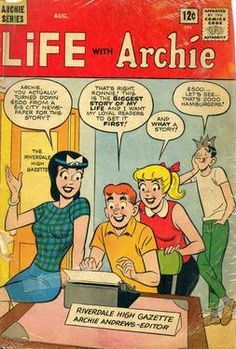 I’d also get a few comic books — Archie, Betty, and Veronica or Tom and Jerry or Little Lulu. I’d drink my Coke and ride my bike back up Fifth in the cool shade, then turn right at Deering and pump hard three houses home over the hot concrete under a blistering sun. It was a hundred degrees all summer in the Delta. There weren’t many trees on my street. My Delta Heights subdivision was still fairly new. There were no amenities, no playground, no pool, no sidewalks, just houses back then. My parents knew how important trees were — for shade, to help with electric bills, to provide a sun cover for children to play — so they planted a walnut tree in the far back corner of the yard and two tall pecan trees smack in the middle of the yard. They planted tall hedges around the yard and some flowering bushes. Mama always had zinnias and morning glories. We didn’t have a mimosa tree, though, and I always wanted one. Mama put up a badminton net between those two pecan trees, and we also played croquet in the shade of the trees. We had a swing set, a tall sliding board, a merry-go-round, and a sand box. I made many a mud pie in pecan tree shade. We stretched a Slip ‘n Slide across the yard and squealed and slid in the shade across that. We had a picnic table that Mama painted green and put under one of the pecan trees. I did all my summer reading on that picnic table in the shade of the pecan trees. Now I wonder what my life would have been like without shade trees. 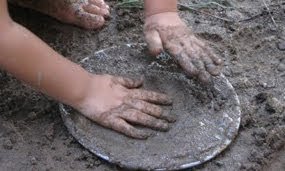 I grew up in the outdoors, playing outdoor games, loving the outdoors and trees and plants and flowers and fresh air and grass and stars and the smell of green growing things. My imagination grew there, too. 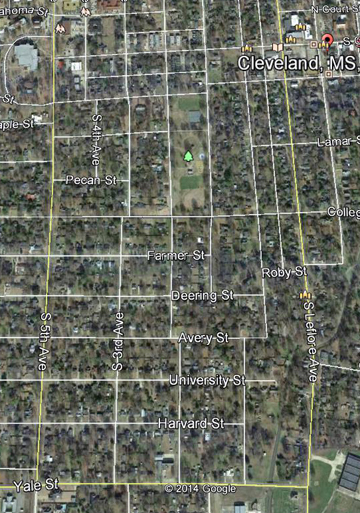 I’ve lived my life thankful for Fifth Avenue and for those Deering Street pecan trees. And grateful to my parents for teaching me to appreciate nature. My dad grew up on a farm. I now own part of the land — which used to be in crops and timber — that belonged to my dad, my grandfather, his father, and his father. I’m the fifth generation. The land is now a pine plantation. Yes, I own a tree farm, a real Mississippi plantation. I own lots and lots of trees! But I live in a new subdivision in Tennessee. We have no trees. We do have amenities; we have a half-mile sidewalk uphill and down to the playground and pool in direct sun — not a tree anywhere in sight, just hot concrete. I feel so sorry for the children who make that walk daily to the pool . . . or maybe they ride in a cold car . 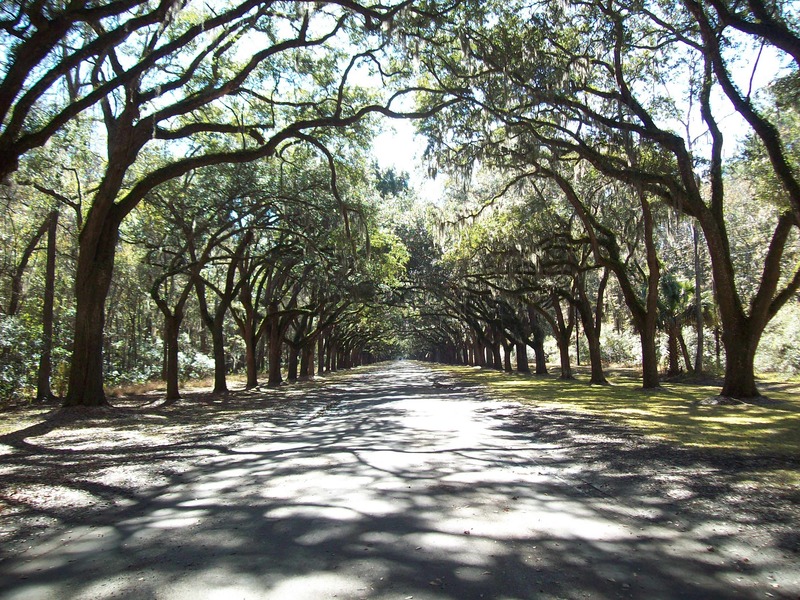 . . and I remember my Fifth Avenue and my bike rides in the cool shade of old oaks. And I remember my play in the shade of my back yard pecan trees. And I remember summer fun by the creek under ancient trees on my grandfather’s farm. And I pity today’s children whose parents only value pools that are a long hot walk away and hot playgrounds and hot benches to sit on and watch their kids swing and play in a blistering hot summer sun. How does a little girl sleep at night? I remember leaning on my window sill after bedtime, looking up at stars in the black sky and smelling the honeysuckle on the back fence and wondering what was out there and what if it came down on me and my little town. I remember visiting one set of grandparents in the city of Cincinnati and looking up beyond tall buildings and worrying that a bomb would hit at any time. After all, it was a city, and cities were targets. I remember visiting the other set of grandparents on a farm in the Mississippi Hill Country. At the edge of the woods was a gully, deep, thirty feet, maybe forty. A natural spring came out of the ground at the bottom and ran in a gentle stream the length of the land. The red clay cliff walls deterred any climbing down to the bottom, but I could walk into the gully via the stream bed. One summer day I did just that and pulled myself up to a protrusion in the wall and sat for a while thinking. I looked up at the sunshine filtering through ancient trees at the top. No one could ever find me here. I vowed to come to the gully when it happened — end times, the bomb, the apocalypse, the burning of Babylon, the crash and failure of society. After all, everyone needs a plan. I wonder now if I passed on my fear of end times to my own children. When they were little, we had our own secret code word that reflected catastrophe. I won’t say what it was, because it still is our code word. Just yesterday as I told one son I was preparing to buy a new car, he said, “Good, make sure you have a sleeping bag, a tent, and some survival supplies in the cargo area, and you can head this way [North Carolina] when the time comes.” (Actually, I do have two survival bins of supplies in the garage next to the back of my car, ready to load in an emergency.) Just yesterday I sent the other son a text message and in the middle of it, that code word happened to appear. “Are you trying to tell me something?” he replied. No, I wasn’t. The apples don’t fall too far from the tree. I’m thinking about all this now because the other day I found an old book that my husband bought in September 1969, so written on the inside cover. Alas, Babylon is the title. 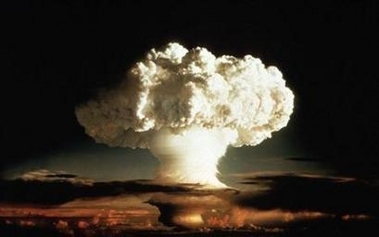 It’s a novel published in 1959 about nuclear war with Russia–the dropping of the bomb–and the end of the world. I read this book when I was child, maybe twelve, and it made an impact on me, not only because the subject matter was what it was, but also because it was really an adult book with adult language and situations, and my mother let me read it. One summer week I lay on top of the picnic table in the back yard under the pecan tree, sap dripping on me, and read about Randy in the fictional town of Fort Repose, Florida, near McCoy Air Force Base, who got the warning of doom from his Strategic Air Command brother Mark and experienced the bomb and the rebuilding of life after. 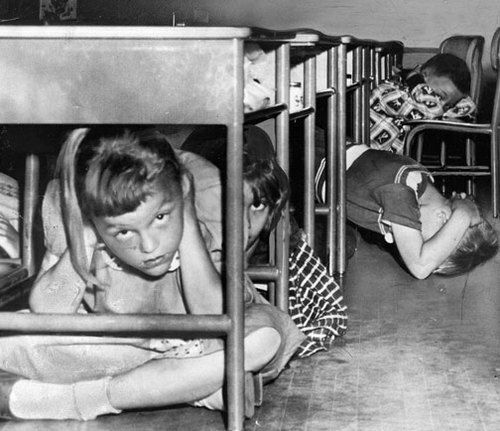 I guess I never got over the Cold War fears of the 50s and early 60s. By the mid-60s, though, Kennedy had been assassinated, Vietnam was on the world news every night on TV, and the bombs and fires and fiery actions of the civil rights movement were on the local news. And a girl tends to push back the H-bomb when all that is happening. 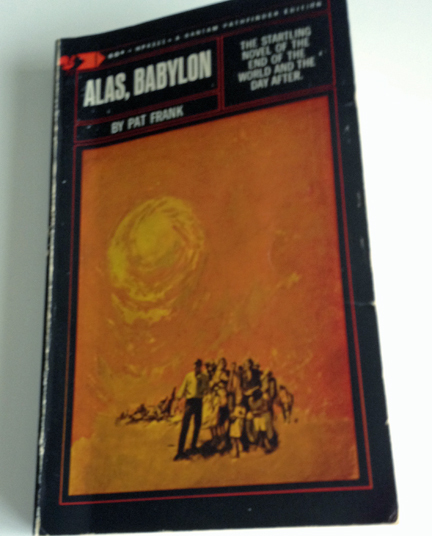 Now I return to read Alas, Babylon. 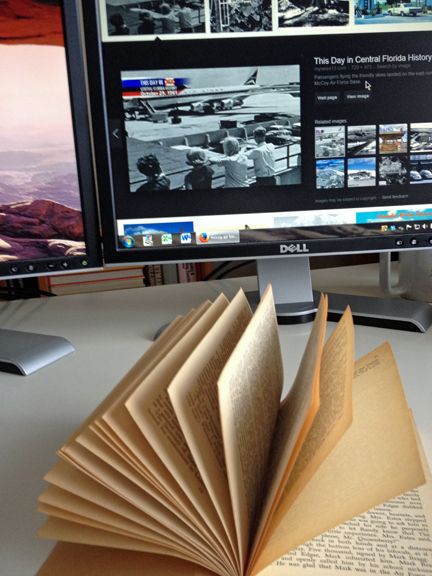 The original version in paperback — the complete text of the original hardcover edition, not one word omitted. My sons read the book in high school as required reading, but it was a cleaned-up, dumbed-down version. This is the real sixty-cent deal. THE DAY AFTER THE BOMB DROPPED the thousands of years of “progress” that had covered the treacheries and weaknesses of ordinary man with a thin veneer of civilization were dissolved and melted like snow on the desert’s dusty face. All this makes me want to say: Please, America, for the sake of little girls and boys everywhere, let’s work together and do this thing right. Let’s give and take, let’s don’t push for radical extremes, let’s don’t fight for our own ONE way, let’s be tolerant of others. Let’s work together for the good of all. Let’s keep “progress” and keep it going. 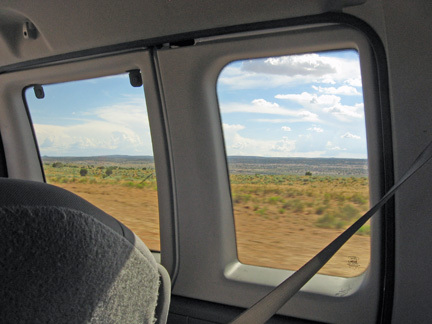 We were in Navajo Nation in Arizona somewhere along the hot, barren Highway 89 near its junction with 160 which goes to Tuba City. It was the fourth day of our summer trip — seven of us, family, from Memphis, Oxford and Tupelo, Mississippi, and the Nashville area — and we four ladies had not yet bought any jewelry. We’d talked for months about buying earrings from a real local artisan. So when we saw the long segmented line of roadside vendor stands, we all yelled, “Stop!” The white Ford van pulled into the desert dirt in a cloud of dust, and we all piled out to look at the wares. Judi and the men were quick to get back on the van, but Lee, Sally, and I got caught up midway at the tables of a Navajo man named Lawrence Alfred, who was wearing a red and black Redskins cap. 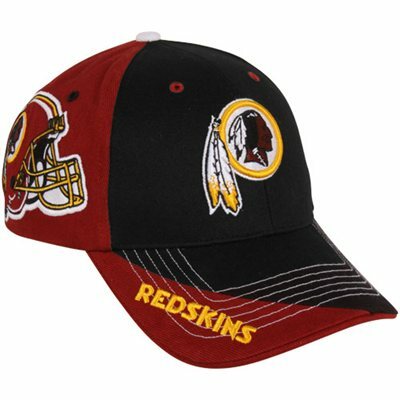 A Washington Redskins football team cap? He was interested in languages, he said, dialects in particular, and he wanted to know about ours. We were all Mississippi born and raised (Cleveland and Oxford), and he asked where the Southern dialect had its origin. I tried to tell him about my Scots-Irish ancestors and how they settled in the eastern mountains and then migrated into Alabama and Mississippi looking for land, and how the speech of all related settlers influenced the language patterns of the people in the South. I did not tell him how my people moved to Noxubee County, Mississippi, in 1833 after the Dancing Rabbit Creek Treaty was signed, opening the land for white settlement. I bought a pendant from him with a blue-green turquoise stone that was made by his uncle. Then Lee turned the conversation and asked Lawrence Alfred about his Redskins hat, and we got his story. 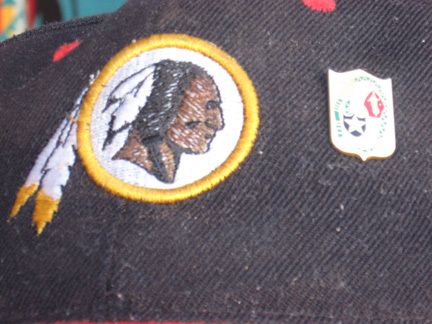 He was a Redskins fan, and the name, in a push to be changed so as not to offend Native Americans, did not offend him. He knew the history, he said. He pointed to the red rock mesas all around us. “We got red clay from the mesa and used it as a sun screen. We rubbed it on our arms, and so people called us the red men.” He would be offended if the team did change its name. History explains the meaning. Awareness brings acceptance. I wish my people could understand the importance of a name or a concept based on its history, or even historical truth. But as terms and their interpretation change to succeeding generations who are either clueless or embarrassed, my people want to change history instead of understanding it and learning from it. Lawrence wore his grandfather’s military pin on the cap. His grandfather, now deceased, was a World War II veteran. He was a Navajo Code Talker. Johnny Alfred was his name. The little-known language of Arizona’s Navajo Code Talkers helped lead the Allied forces to victory over Japan in WWII. The Navajo men developed an unbreakable code alphabet from their language by attaching familiar words to letters. For example, one way to say the word “Navy” in Navajo code would be tsah (needle) wol-la-chee (ant) ah-ked-di-glini (victor) tsah-ah-dzoh (yucca). The enemy could not break the code. The Code Talkers took part in every assault the Marines conducted in the Pacific from 1942 to 1945. In 1982 President Ronald Reagan signed a proclamation honoring them. “Equipped with the only foolproof, unbreakable code in the history of warfare, the code talkers confused the enemy with an earful of sounds never before heard by code experts,” Reagan said. In 2000 President Bill Clinton awarded the original 29 Code Talkers the Congressional Silver Medal. I felt a kinship with Lawrence. My dad was a WWII veteran. Then I learned Johnny’s wife was named Lucille, as was my mother. Johnny Alfred was 22 years old when he enlisted in the Marines in October of 1942. He survived four of the bloodiest battles in the Pacific: Tarawa, Saipan, Tinian, and Okinawa. 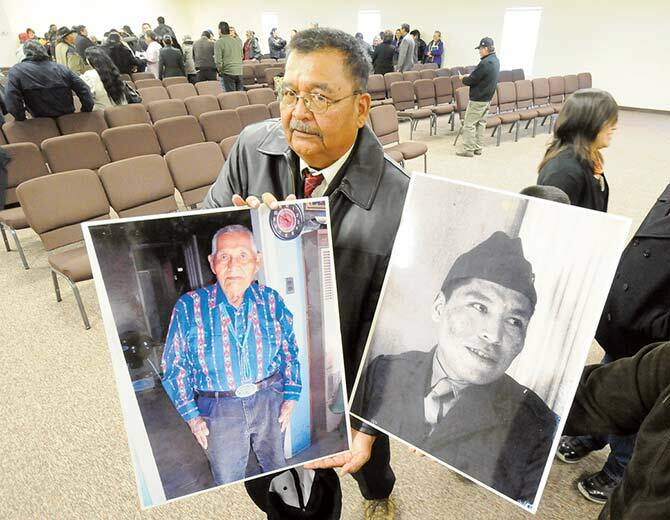 He brought honor to the Navajo Nation and the Navajo language. No wonder his grandson is interested in languages. 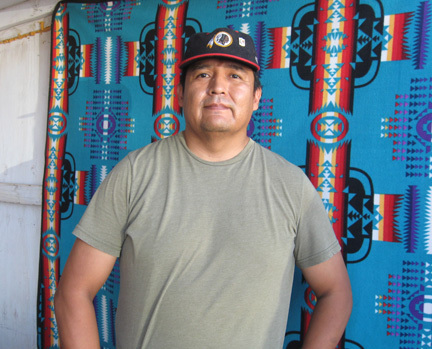 Navajo flags were flown at half-staff when Johnny Alfred died in 2011. Johnny Alfred brought honor to America. Lawrence’s aunt drove up and came over to enter our conversation. She had been out on the mesa gathering pieces of petrified wood. She gave one to Lee, Sally, and me. This is a family who wants to keep its stories alive. I treasure this, and I treasure meeting Lawrence, his aunt, buying his uncle’s pendant, receiving the gift of petrified wood . . . and most of all, hearing the stories.